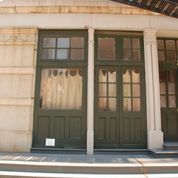 Historical Windows was contracted to furnish and install 6 storefront bays in a ground floor apartment matching the design specifications and profiles provided by the building architect and approved by the NYC Landmarks Preservation Commission. Extensive interior work was also required. We used a Parrett Windows & Doors custom storefront fabricated with South American Mahogany, as specified by the architect as well as a custom mortise assembly. We collaborated with a NYS licensed structural engineer to design an anchoring fastener schedule and worked with our ironworks specialist to install structural steel framing to support each bay. 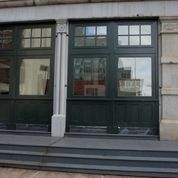 Due to the weight of the units, special handling equipment was required to get the storefront windows in place. The interior walls were rebuilt, insulated, sheet-rocked and painted. Since the installation of each bay would take several days, we erected temporary walls to protect the space during non-working hours. New interior walls were erected and the 6 bays and storefront were installed. A.J. Iron Work Innovation Corp.